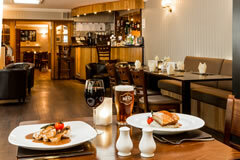 Our restaurant is locally renowned as one of the finest places in this area to enjoy a cosy, mouth-watering meal. After extensive refurbishment, the restaurant exudes a warm and welcoming ambience, complemented by stylish, tasteful décor and furnishings. 12-2.15pm. Our full lunch menu is available or we offer a “Light Bite” menu, including sandwiches, toasties and home-made soups. Lunch time only! Booking always advisable. Dinner menu is served between 6.30pm – 9pm and an extensive A La Carte menu is offered as well as various seasonal specials and local seafood. To complement your meal a wide selection of quality, but affordable wines are offered. The restaurant serves a selection of freshly prepared dishes, overseen by our Head Chef, Douglas Lisi and his team. 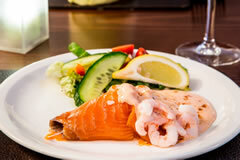 We utilise an abundance of fresh, local produce such as succulent Scottish beef, and fresh seafood from the West Coast. Traditional favourites are always on offer and we are confident that we can cater for any palette. The Tigh Na Mara hotel can also cater for small private or business functions, such as birthday parties, engagement parties, seminars, retirement dinners or lunches. Please contact Neil Fisher to discuss your personal requirements in detail. Our Head Chef, Douglas Lisi has a wealth of experience and is well known locally and far afield. The restaurant has gone from strength to strength and is highly recommended by locals and visitors alike. Our attentive and friendly waiting team always aim to please and we strive to ensure that your dining experience is as enjoyable as possible. 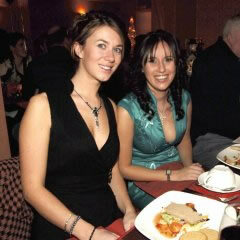 The hotel and restaurant is now run by Neil Fisher who has been with the company since 2004. After completing a degree in hospitality management, Neil has worked in some of Scotland’s finest restaurants and hotels.